Orion Panel: The State of Search – A Maturing Marketplace or Poised for More Growth? Our moderator is the witty Kevin M. Ryan, the chair of the SES Advisory Board and CMO of WebVisible, Inc. Our speakers for this high-level strategy session are: James Colborn, director of Microsoft advertising at Microsoft; Robert Murray, CEO of iProspect; Steven Kaufman, SVP media director for Digitas; Jon Diorio, group product manager for AdWords and Monetization Products for Google; and Jeffrey Pruitt, executive VP of iCrossing and president of SEMPO. Kevin says that the focus of the session is talk about the history of search, where it’s going and the key drivers of search. He’s showing us a slide of a “day in the search life”. Growth of search is coming out of Europe, North America, the Asia Pacific followed by Latin America, the Middle East and Africa. Search has to be thought about in the global economy. Search drivers include search engines and social networks and forums. On the chart, social networking was a growing driver until June of 2007. Then it went down and up and down again. Search, meanwhile, has a steady, gradual growth slope. In 2007, 87 percent of mobile customers weren’t online. By 2011, almost 90 percent of mobile Internet users will be searching. Users expect exact information whether on a mobile device or on their PC, but mobile users immediately act on in. Jon says that the critical point is not the technology or how the ads are rendered — it’s about what message resonates with the user while they’re wandering the streets on their mobile. He’s spending a lot of time studying how mobile search differs from standard desktop search. Kevin asks if we’re going to see a significant number of searches coming out of mobile soon. Jon says that mobile is considered experimental and in the poor economy experimental methods are being cut. It won’t be as big as it could be until we get past the recession. Kevin asks Steven, as an agency representative, where his clients are spending the money. Steven says that on the search side, acquisition is the number one cost and it’s not going to be cut because it’s measureable and accountable and justifiable. The branding value of search is a more challenging argument. Robert says that in 2008 large brand marketers were putting themselves in search. 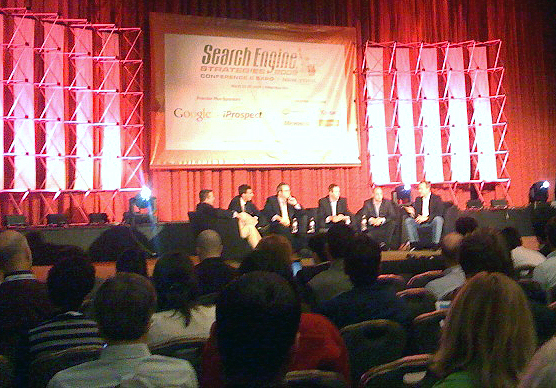 Now they’re asking how to make search more effective, how can they use display and other types of advertising to drive people to search. Two-thirds of online search users are driven to perform searches as a result of exposure to some offline channel. Both TV and word of mouth influence over one-third each. Jon mentions that he saw a business that had a TV ad campaign that drove searches, but they weren’t showing up for those searches so people ended up going to competitors. The problem was the lack of communication between the TV and search marketing departments. Jeff adds that in the SEMPO state of the market survey, brand was the first priority and driving conversions was the second. However, fewer businesses were tracking their branding efforts than their conversions. Brands are engaged through many different channels and all those become a search component. James says that search is user-directed information sourcing. For Microsoft the challenge is to help advertisers understand all the ways search can be used to improve search results and also to help other media. Jon says search people should go to other marketing departments with keywords. Are people walking down the hall more than in 2004? Steven says clients are catching on and demanding more. Pitching business as a team is getting better. It’s still not great and there are still fights over budgets, but it’s getting better. Jeff says that multiple budgets are coming together better but there needs to be an initiative driven from the top level and incentivized. Robert says that there’s more willingness to engage in dialogues as people are trying to make their budgets go farther in the tight times. Kevin wants to know if we’re talking in the inner circle and not getting to the wider population. Jon says he agrees that there is definitely an inner circle but as far as awareness of search, it’s very high. The cryptic piece that’s left is the interplay between the channels. James says that search is finding an easy place and adoption as a direct response channel but brand environment has more barriers to entry. The brand arena is not moving online as quickly. Jon says there is more brand value from search than people realize. Google is looking at studies of 15-20 verticals to study brand value. They asked people in a panel in a controlled environment to do a specific search. Everyone sees a variation and then they are asked about propensity to buy. They’re finding that organic plus paid results in higher brand awareness and a decrease in competitor brand awareness. What is an evergreen challenge in search? James says an evergreen challenge is to address the person’s reason for going to search. There is still a lot of variation in the words used that result in different ads being shown. The goal is to make sure the queries are answered as best as possible. Robert says the heart of the problem is attribution and understanding the full purchase cycle of a consumer. He wouldn’t advocate search alone — it’s a mix. James says that search is the last click but the billboard can be what gets you there. Kevin says that according to JupiterResearch, there are four top objections to search: insufficient staff, afraid of risking ROI performance, unable to hit financial targets on cost per keyword, and proving effectiveness to management. Can search grow? These are the biggest internal barriers. What do you think is going to be the next stage of development that will help us overcome these barriers? Robert says first and foremost, integrated technology that lets you understand offline and online will help streamline the process. Jon says that answer to a lot of the problems can be addressed with automation services they’re working on now. This would let you do more with less people. On the ROI side, the biggest growth will come from the audience in the room. Search advertisers are looking beyond click through and conversion rate to ROI. The mentality is shifting to a realization that there’s no need for a budget cap if you’re making a good ROI. James agrees and says that eight years ago, advertising and searching was based on one keyword. As time went on searchers became smarter and their queries were more sophisticated. The new goal for Live is to keep up with the trends and make it easy for advertisers to keep up with the trends through tools. Increasing the pool of commercial keywords will add opportunities for advertisers. As the market evolves, the opportunity for advertisers continues to evolve. Kevin says that as CMO, people are trying to sell him crap all the time. It’s hard to figure out what he should and shouldn’t be paying attention to. So take the following questions and answer home. What are the social drivers? Search integration? Growth? Robert says that the integration argument has been beaten to death. If you’re not integrating at least display and email to your search campaigns you’re missing easy pickings. Steven says social is going to continue to grow as a driver. Make sure whatever social content you’re putting out is findable and indexable. As for growth, the product needs to evolve as well. He mentions search retargeting and Yahoo rich ads as evolution. New products will help overcome search integration barriers. Jeff says that the engine relationships with marketers are getting better. The engines are asking for feedback with issues from advertisers. Integration is a point to focus on because search is really broader than just content in engines. The distribution can be optimized in engines and social networks. They’ve all got to come together under the same plan at some point. James says that now the plethora of solutions available means finding the right mix of media and targeting types to solve campaign objectives. Without stepping on toes, there’s a growth opportunity in engines suggesting new channels to the advertisers. As for as social drivers, they are very interested in becoming the key search provider for Facebook and offering educational opportunities to advertisers and create solutions for advertisers, agencies and partners. Jon says that in the growth arena they’re looking at words that aren’t being monetized today. They’re working to open up the inventory and make it more accessible. In a study they found that users are searching longer and deeper in their research. This means branding at the early stages is important. @steve, agreed. Paid search was definitely the focus. Great post … was twittered here by Lisa Barone – as she said this report was better than the one she posted herself. Let’s just say I really benefitted from reading this after Lisa’s post. I’m sure I now have the full info. it sounds like when they say “search” all they are talking about is PPC? or is it just me?